Her personal opinion on the Abbott interview summed it up for so many that the original tweet was retweeted nearly 500 times. ‘I would like to stress that I am not an expert and I am not voting for Tony Abbott or Julia Gillard, partly because neither fit my values. I am straight and in a relationship with a man. I marched in the Gay Mardi Gras this year and it was an incredibly positive experience.’ (Read more here). I hope these examples show why I don’t waste time bemoaning the appalling state of the mainstream media and its clear and present bias in favour of Tony Abbott. This will be the first election heavily influenced by social media, and who knows what will happen. I urge all who care about the result of this crucial election for Australia’s future direction to jump on Twitter and Facebook and play your part in shaping the debate. I will follow the precept of American journalist Mary Kissel, aiming to make people who disagree with me feel compelled to read what I write. This is a time to reach out, not turn inwards, to be open, not closed, and to be flexible, not dogmatic. And it is a time to have fun while you do your bit to save the world. 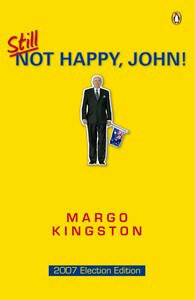 E-book of Still Not Happy, John! now available. Margo, tonight on 7, the journalist reported that TA wants to be the PM for the Aboriginal people. Perhaps the question should be asked. “Did you stage manage the deposing of Terry Mills in the NT and replace him with an Indigenous MP Adam Giles? Someone could also ask whether he did the same thing getting rid of Ted Bailleau in Victoria. Sounds to me as though TA does not have a very good track record when it comes to so called knife in the back. Our current PM smells like roses compared to this despotic man. A man who would do and say anything to get the keys to the Lodge. We need to keep up the pressure on the LNP and particularly TA and expose this man for what he really is. He is a puppet of Murdoch and this is an extreme danger to the democracy in our country. We do sincerely hope that something can be done about the current sad state of the media. Its blatant promotion of one side of our politics for the sole benefit of a handful of influential people over the good of our country is shocking. That the LNP goes along with this, gleefully, all in the name of attaining power is equally shocking. None of this “doing the best for their constituents” for them, unfortunately. So sad.